Watch a (1:08) video tutorial - Do I Need Pay Periods? A Pay Period is a recurring length of time over which employee time is recorded and paid. Pay Periods can be one of the following: Weekly, Bi-Weekly, Monthly, Semi-Monthly, or Custom. A Pay Period can start on any day of the week. It’s very important to create Pay Periods as it will help you manage and maneuver through the system more efficiently. If you do not create Pay Periods, you will not be able to Approve Time and Close Pay Period (which marks each time entry with a pay date). Note: Only one pay cycle is allowed. For example, you can not have both a weekly and a monthly set of pay periods. To add a pay cycle that is not one of the common options (weekly, bi-weekly, monthly, or semi-monthly) use the pay cycle drop-down option Custom in the Add Pay Period window. This custom pay cycle can also be used to add only one pay period; Jackrabbit does not auto-populate pay periods for custom cycles. 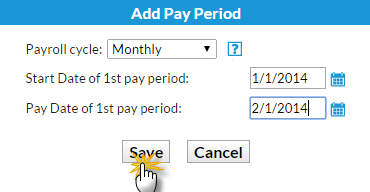 In the Time Clock Pay Periods section, click Add Pay Period. In the pop-up box select the Payroll cycle. Enter the Start Date of the 1st pay period. This is the date of the first work day in the pay period. Note: If you select Semi-Monthly (i.e. staff are paid on the 1st & 15th of month), you'll need to enter the start date of the 1st and the 2nd pay period. Enter the Pay Date of the 1st pay period. This is the date that the staff receive their wages (check date). Note: If you select Semi-Monthly you'll need to enter both the 1st and 2nd pay date. Verify that you have entered the information correctly. Click Save. Click OK to confirm. 12 months of pay periods based on the payroll cycle you have chosen are created. Note: When adding a custom payroll cycle you can enter as many periods as you wish, Jackrabbit does not auto-create periods for custom cycles. ...creates 12 monthly pay periods for 2014. Pay Periods must be deleted if an error is made, there is no way to edit them once they have been created. Deleting pay periods does not delete any time entries that are associated with them. The entries remain intact, however, when you view a staff member's Time Clock tab you will not be able to display the entries using the Time Period drop-down until you have added new pay periods. Any Clock report offering Pay Period as a filter will also be affected until new pay periods are added back. If you delete a pay period in error use the Custom payroll cycle, in the Add Pay Period window > Payroll cycle drop-down, to add back the deleted pay period. With the Custom payoll cycle you are able to add as many pay periods as you need; pay periods are not auto-populated for custom cycles.